Info "Oh no! A thief has stolen one of your beloved belongings. Please use the clues in the picture to solve this conundrum...in 40 seconds." Sneaky Snatcher is Orbulon's boss microgame in WarioWare Gold. Its theme and music are derived from the minigame Fruit from Game & Wario. The player has a total of 40 seconds to determine the character who stole the object based on the pictures that were taken of the thief. 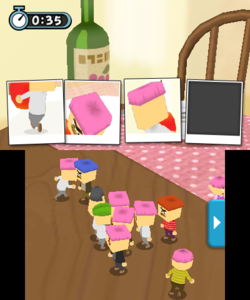 The player must pay attention to the character's hair, head shape, clothes, and face to find the thief. 1st level difficulty: There are four pictures to use for finding the thief, but the fourth picture isn't revealed until a few seconds pass. The thief steals a cherry. 2nd level difficulty: There are three pictures to use for finding the thief, but the third picture isn't revealed until a few seconds pass. The thief steals an eraser. 3rd level difficulty: There are three pictures to use for finding the thief, but the second and third pictures aren't revealed until a few seconds pass. It is dark in the room as well. The thief steals a dorayaki. This page was last edited on March 14, 2019, at 20:55.